Watch the Jimmy Kimmel star ceremony on the Hollywood Walk of Fame below. The Hollywood Chamber of Commerce honored television host Jimmy Kimmel with a star on the Hollywood Walk of Fame on January 25, at 11:30 a.m. at 6840 Hollywood Boulevard in front of the El Capitan Entertainment Centre where his show resides. 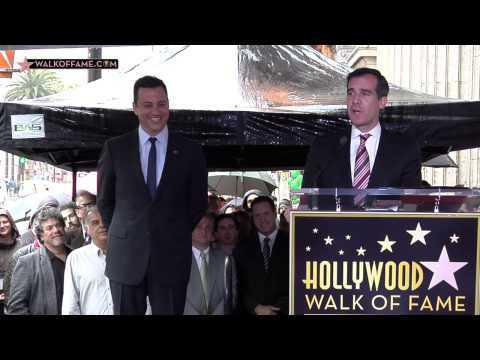 Emcee Leron Gubler, President & CEO of the Hollywood Chamber of Commerce and guest speaker Carson Daly helped Kimmel unveil the 2,489th star in the Category of Television. Born in Brooklyn, and raised in Las Vegas, Kimmel began his career in morning radio. Fired from stations in Phoenix, Seattle, Tampa and Tucson, Kimmel’s luck finally changed as ‘Jimmy the Sports Guy’ on KROQ-FM Los Angeles’ “Kevin and Bean Show,” where his popular comedy sportscasts never even got him fired once. As host and executive producer of the Emmy nominated late-night talk show “Jimmy Kimmel Live” for the ABC Television Network, Jimmy Kimmel is a busy man. Like most talk shows, “Jimmy Kimmel Live” features celebrity guests, comedy bits and live music. Unlike most talk shows, it also features Jimmy’s family – including his cousin Sal, his parents and Aunt Chippy. His childhood best friend, Cleto Escobedo, serves as bandleader, alongside his dad, Cleto Escobedo, Sr., on saxophone. ABC has recently rescheduled “Jimmy Kimmel Live,” the late night staple to air weeknights at 11:35 p.m. In September Kimmel hosted the 2012 Emmy Awards. Earlier this year, Kimmel was the headliner of the annual White House Correspondents’ Association Dinner in Washington, D.C. Kimmel has also hosted the American Music Awards on ABC five times as well as the ESPY Awards. He co-created and executive-produced the hit MTV2 series’ “The Andy Milonakis Show” and “Crank Yankers.” In addition, Kimmel co-hosted Comedy Central’s “The Man Show,” served for four seasons as on-air prognosticator for “Fox NFL Sunday,” and co-hosted Comedy Central’s long-running and popular game show, “Win Ben Stein’s Money,” for which he received two Emmy nominations and one win for Best Game Show Host in 1999. Kimmel has also served as roastmaster for Comedy Central’s roasts of both Hugh Hefner and Pamela Anderson. Jimmy Kimmel is involved with the following charities: The San Gennaro Foundation, Alex’s Lemonade and CTC International.